Here is how it looks in the natural sunlight.... shows the stamped image better but you can hardly see the globe! LOL! This project's greatest challenge was the photo! Hope you like it! Thanks for visiting and for your comments which are so appreciated! Oh my goodness Grace!! This is over the top gorgeous!! I LOVE IT!! So much texture and dimension and the colors are stunning. Perfect with the globe!! Great card! Thanks for joining us at I DID IT CREATIONS CHALLENGE # 80! Grace, forgot to mention that I saw your lovely creation on MIM. Your work is so special, I always look forward to seeing your latest offering. 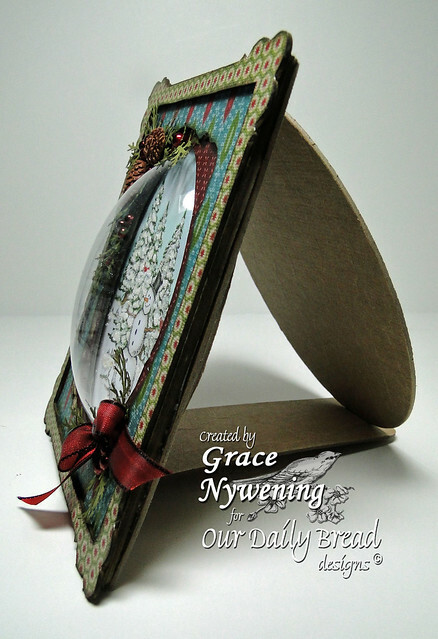 I haven't seen a 'globe-d' card I've liked until this one Grace. It's absolutely wonderful. Love your colours, texture and design. This is absolutely stunning! I've never seen such a gorgeous snow globe. The frame is just over the top as well as your entire design and coloring. You are such an inspiration! So wonderful Grace,I love the image and the colours. This is absolutely stunning, Grace! I love the papers and embellishments! The scene inside your globe is gorgeous! Wondrfully creative design! Your card is simply stunning! I dont't works. Design, details, glitter effect.. simply amazing. Really a terrific job! It's a perfect Christmas gift. Thanks for joining us at Christmas Inspirations challenges. I hope see you again!! Oh my word this is amazing!!! I just keep looking at all the details. What an inspiration. Thank you so much for joining us at MIM! Remember to be in the running to win this week's fabulous prize, just leave a comment for another entry and mention you saw it on MIM! The more comments left, the greater your chance of winning! Good luck! Wow, this is amazing! You put so much work into this! I hope you win all the challenges you entered. Marvelous work! Thanks for joining us at Christmas Inspirations this fortnight. Hope you will play again next time too. do hope things are starting to work out for you and yours. Oh, goodness Grace, this is gorgeous! A beautiful piece of art from the heart. Wow! Grace, this looks amazing! This card is stunning. You are so creative and a talented card maker, the love and time you put into each one is shown here. Thank you for sharing. Ooops - needed to edit my comment and add some more praise for you....just love the patterns of the papers you used, they just look outstanding together as they frame that adorable snowman globe.....just the kind of keepsake one can put out each year as they bring in the holidays....so lovely Grace, you are so talented and creative, enjoy following what you do. Saw this on MIM as well. Hugs to you. Really cool frame! I am loving the papers and that image is just way sweet! So cute, and detailed, Grace! I saw a little luminary box you made and it was hanging from a gold-colored hook thingy. Here's the link - can you tell me what the hooky-thing is called, and where you got it? Thank you for the music on your blog! I visit it just to listen! God bless you, Grace! 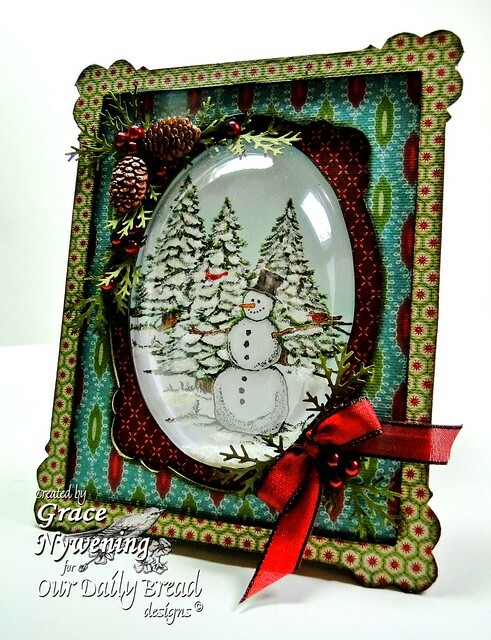 Gorgeous creation Grace :-) the image is adorable and the colours and design are fab :-) I love the sturdy frame and snowglobe,amazing !! Grace, this is stunning! Thank you so much for sharing it with us at the Creative Inspirations Paint Challenge. We hope to see you back next week and good luck! 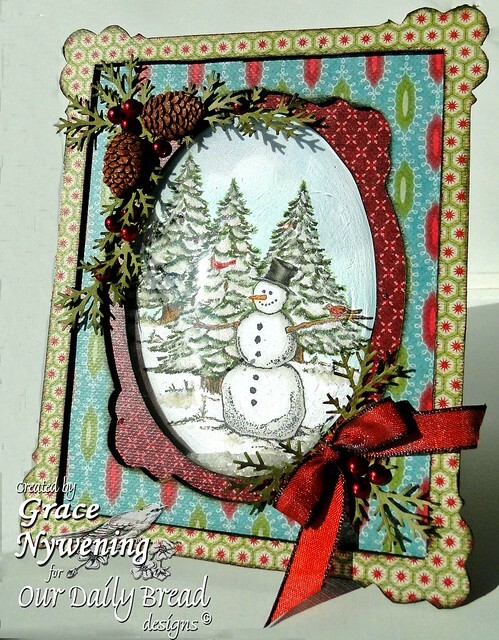 Oh my goodness...Grace, this snow globe scene captures the wonder and magic of nature and the beauty of the season so perfectly! !I love all your added elements...just gorgeous! !What a keepsake card!! Wow, how great, really wonderful !!! Thanks for joining us at Stamps & Fun = CREATIVITY. OMG yor frame looks so beautiful,a really fantastic work.Thank you for sharing this with us at SFC. Grace: I'm so glad I stopped by - what a gorgeous creation! The reason I stopped by was because I wanted to let someone on the SSIC Design Team know that Linky is not up for the new (today's) challenge. Several people have commented saying they too cannot find Mr. Linky for this challenge, and i figured you could let the appropriate person know. I'm so glad I stopped by your beautiful blog. Thanks for sharing this. Hi..Why there is no card for the SSIC nowadays? This is a complete sketch, and the details are wonderful. Your card is gorgeous. Thank you for joining Di's DigiDesigns Challenge.